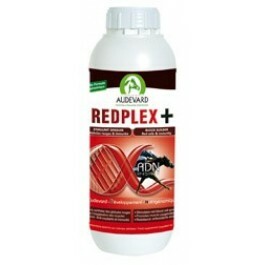 Redplex+ is a complementary feed formulated by AUDEVARD Laboratories. It is designed to provide additional nutrition for horses in training and competition, as well as those that are under performing. Redplex + provides nutrients such as vitamins and minerals (iron etc.) that are especially valuable for horses that are being worked hard. Muscle power and strength depend on how well oxygen is transported by red blood cells. Veterinary surgeons therefore carry out regular blood tests on sport horses. These may indicate a need for increased nutritional intake to address an iron deficiency, for example. The Redplex+ formula has been popular for over 15 years, thanks to its high concentrations of iron and other nutrients contributing to red blood cell production, such as vitamin B12. The formula is also enriched with extracts of Angelica sinensis. With over 20 concentrated ingredients, Redplex+ is truly comprehensive. Redplex + does not contain any ingredients that could lead to a positive result during anti-doping tests, and can therefore be used safely in all circumstances. 1 litre - sufficient for up to 33 days use. Raw materials: Monopropylene glycol, potassium chloride, magnesium chloride. Additives: 2b- Aromatic substances : angelica (Angelica sinensis - ext.) 7,100 ml. 3a- Vitamins, provitamins and substances with analogous effect : E672 vitamin A 870,000 IU, E671 vitamin D3 120,000 IU, 3a890 choline chloride 6,900 mg, pantothenic acid B5 1,670 mg, 3a700 vitamin E 1,200 mg, vitamin B1 1,030 mg, vitamin B2 870 mg, 3a831 vitamin B6 270 mg, 3a316 folic acid B9 245 mg, E300 vitamin C 200 mg, vitamin B12 4 mg, biotin 0.5 mg, 3b- Trace elements : E1 iron (chelate and sulphate) 11,000 mg, E6 zinc (chelate and sulphate) 3,850 mg, E4 copper (chelate and sulphate) 1,330 mg, E5 manganese (chelate and sulphate) 1,330 mg, E3 cobalt (sulphate) 70 mg, E8-3b8.10 selenium (Selplex and selenite) 23 mg, E2 iodine (potassium iodide) 10 mg. Technological additives : E 310 propyl gallate 60 mg, E320 BHA 30 mg.
Analytical constituents: Humidité 91,1 %, protéines brutes 1,4 %, matières grasses brutes 0,3 %, cendres brutes 3,7 %, cellulose brute 0,01 %, potassium 0,35 %, magnésium 0,07 %. Nutritional support for training and competing horses, or horses with lack of tone. 30 ml to 60 ml per day. Shake well before use. Pour onto the feed or give directly in the mouth.